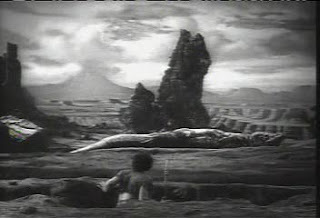 The 1940 movie One Million B.C. is a classic caveman/dinosaur flick. 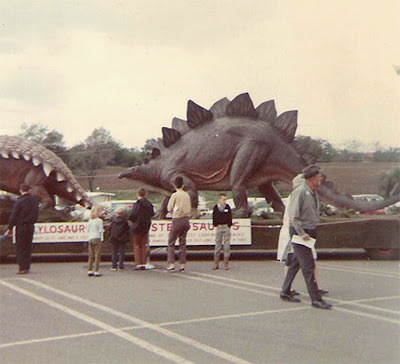 It was quite a spectacle for its time. 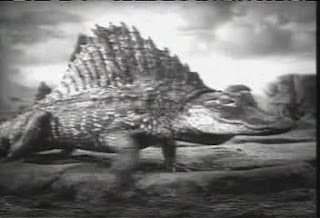 Lacking a budget sufficient for stop action dinosaurs the film makers took a different approach, using various living reptiles and mammals enlarged through photographic gimmicry to an immense scale relative to the cavemen. The best known of these segments involves a real life battle between an alligator and a goanna lizard.The alligator was made appropriately dinosaurian by having a large sail glued onto its back, a la Dimetrodon (which is not a dinosaur and is actually more closely related to mammals, including you and me, than dinosaurs). Ulimately the goanna is actually killed by the alligator and the camera rolls close up to the twitching, bleeding, and dying lizard. It’s brutal and unnecessary. This dramatic footage has been recycled in many subsequent B-flicks. 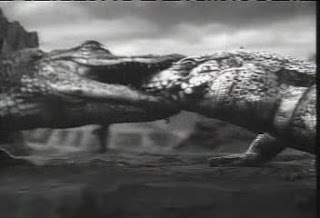 The award for its use least relevant to the story line of a film goes to the infamous 1953 Robot Monster (aka Monsters from the Moon), a film considerably worse than Plan 9 From Outer Space but infinitely better than The Creeping Terror. 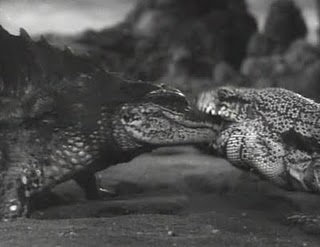 Thankfully modern film standards and the public would not brook such battle-to-the-death nonsense today. However, we still see this kind of thing replayed in real life, most recently in the US Congress. There’s lots of false posturing, roaring bravado, and transparent pretending (like the phony sails, horns, and frills in OMBC) that goes on there. And like the movie real blood is sometimes drawn. Take the 2012 Federal Budget as an example. 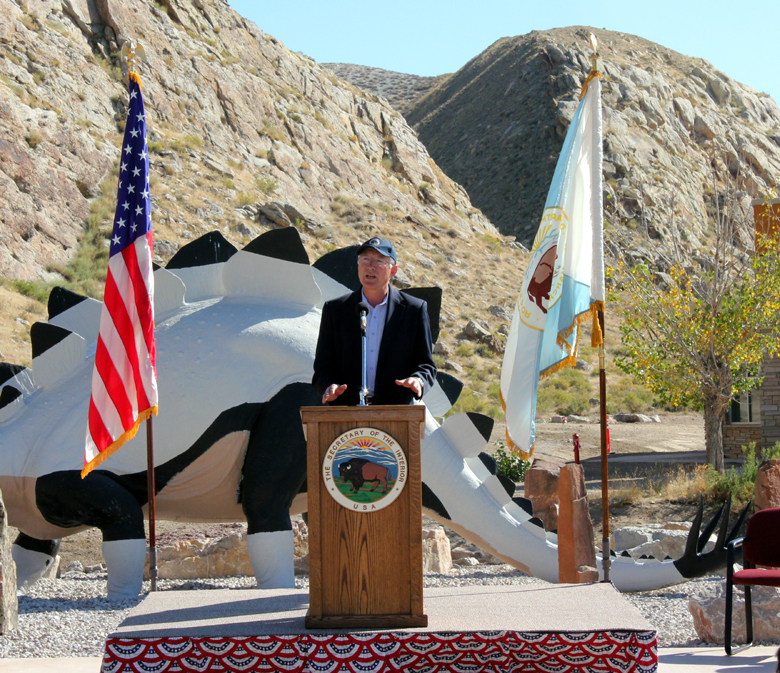 The fiscal year for the federal government starts on Oct. 1. 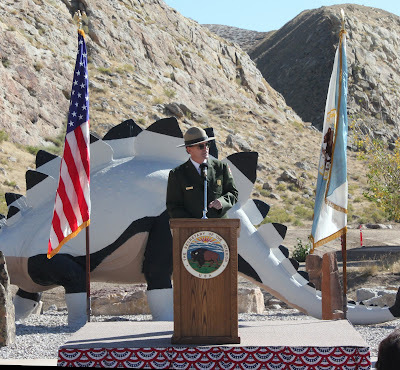 Without a budget bill passed government facilities shut down, employees are furloughed, and National Park campgrounds are emptied and the parks gated and closed to the public. 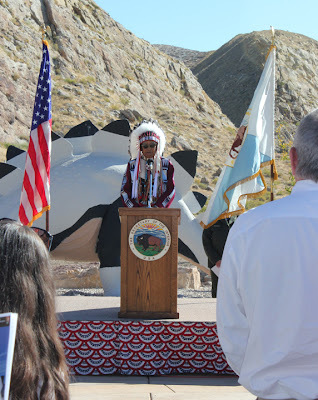 Last week the House of Representatives passed a continuing resolution, a stop gap funding measure to keep the government open until mid-November. They sent it on to the Senate, promptly left Washington DC, and are out all this week. The Senate rejected the House bill. So with less than a week to go there was no funding bill for anyone to agree on and half the players weren’t even around. The Senate then passed a different version of the bill and parliamentary procedure allowed three Representatives to call a House meeting and approve the Senate bill. Whew, close call you say? Well closer than you think and we’re not out of the woods yet. The bill passed by the House and Senate only funds the Federal government THROUGH MIDNIGHT OF OCTOBER 4! 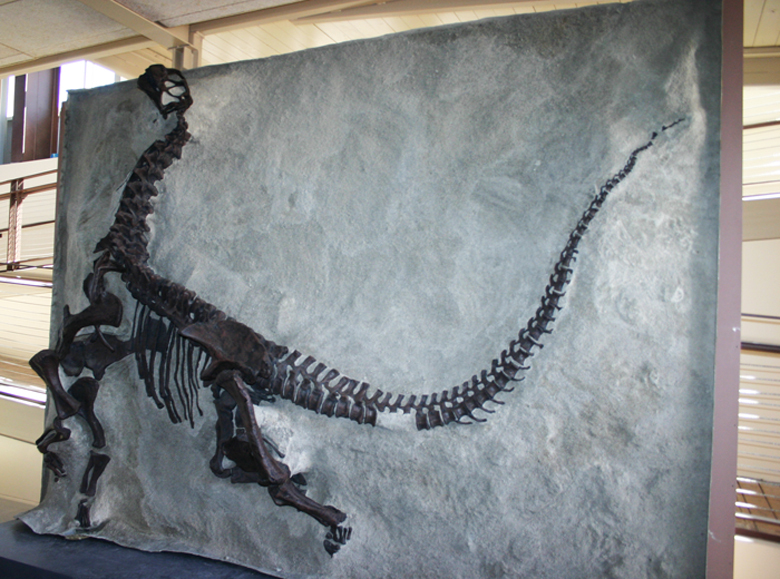 Fortunately, the 4th is the day for the Grand Reopening of the Quarry Exhibit Hall and the wall of dinosaur bones. Being funded through midnight of the 4th will let us have that opening as planned. However, it also means that we will not be able to open after the 4th until a new budget bill is passed. So after five years of closure and planning and 18 months of hard construction work on a $7 million dollar project we may be in the position of reopening the building on the Oct 4th 2011 and immediately closing it on Oct 5th 2011. Can this be avoided? Maybe, but the House will not even reconvene until 2:00 PM on Monday October 3. In its history the US government has closed down 17 times. In my 30+ years of federal employment I can count on one hand the number of times we’ve had a full year budget by Oct 1. 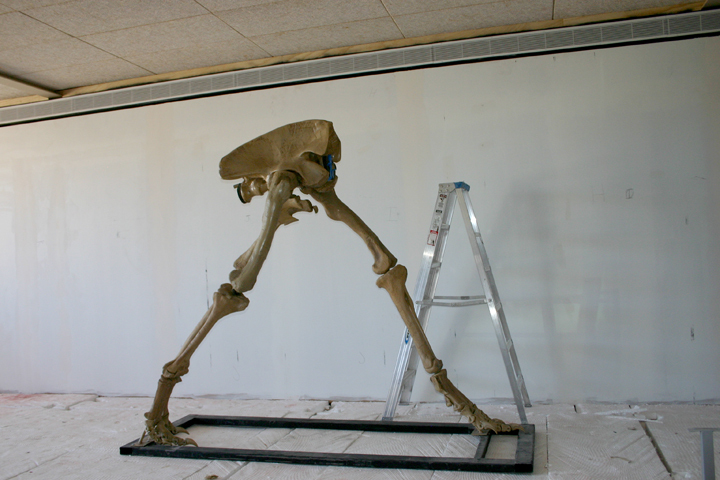 In some years we hobble by on continuing resolutions through March or even April. Living by my personal motto --- that you are only a cynic if you’re wrong, otherwise you are a realist --- I banked on past experience and placed some heavy bets with Paulie Walnuts that we wouldn’t even be able to open on the 4th. Who would have guessed I’d be blindsided by a pro forma session of the House? I guess it’s true, there’s no sure thing in life. Update: The initial posting was done as the story of the opening was breaking in the news. 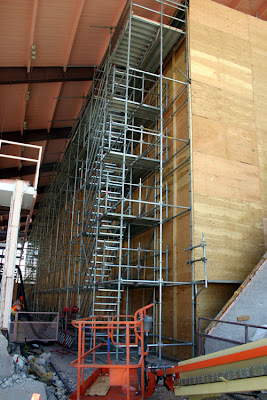 This post has now been updated with additional photos and text. 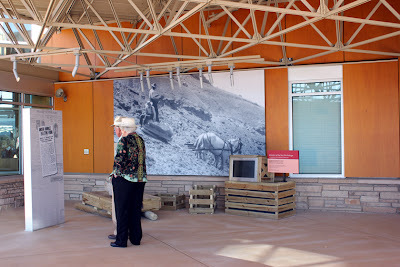 Throughout most of this blog I have concentrated on following the work at what was known as the Quarry Visitor Center, the building surrounding the Carnegie Quarry. I have done this because my interest was in telling the tale of the fixing a very sick building while trying to protect the priceless scientific treasure it was built over to protect. 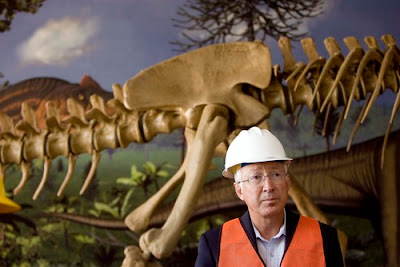 However, the project at Dinosaur actually involves 2 buildings. The other one is ¼ mile down the road from the Carnegie Quarry. 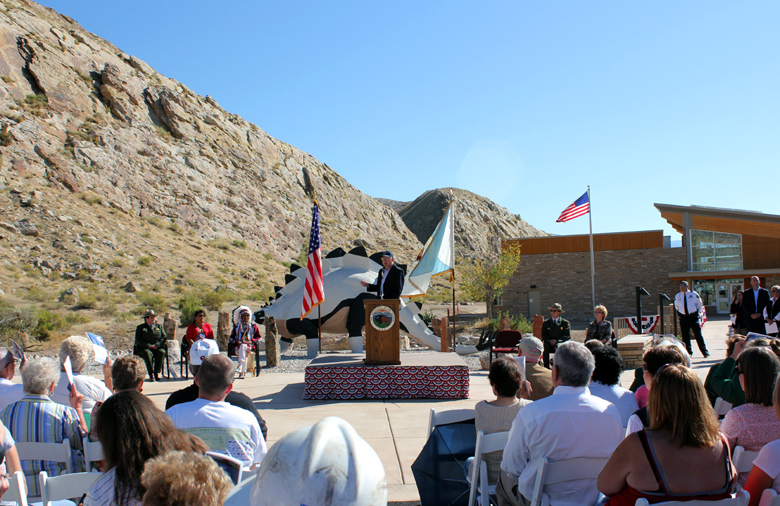 That building will serve the needs of a typical National Park Service visitor center. Before looking at that, however, we need to attend to some nomenclatorial issues. 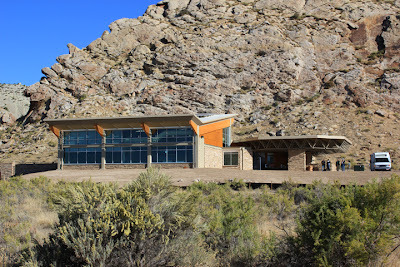 Since it was opened in 1958 the name Quarry Visitor Center has been used for the Carnegie quarry building. Pretty obvious why and quite logical. However, after the new construction project, the name Quarry Visitor Center will be used for the lower building, running in parallel with the name Canyonland Visitor Center which is used for our headquarter’s building in Dinosaur Colorado. 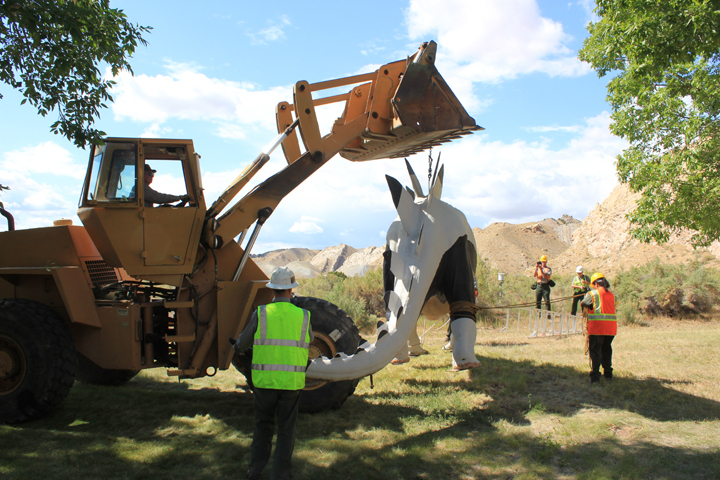 The Colorado half of the park is best known for the magnificently carved canyons of the Green and Yampa Rivers, the Utah half for the Carnegie Quarry. 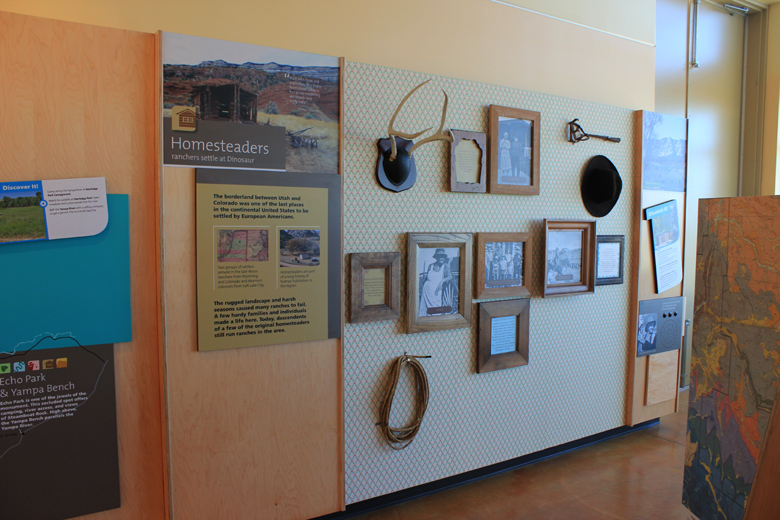 The building formerly known as the Quarry Visitor Center will henceforth be known as the Quarry Exhibit Hall. I shall follow this terminology from this point out. 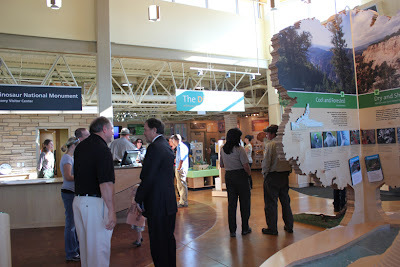 Okay, so what about the new Quarry Visitor Center? As I said, it will perform most functions of a typical NPS visitor center. 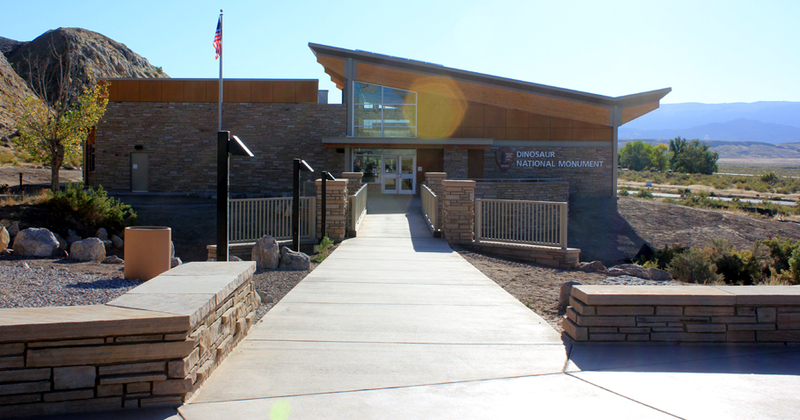 It houses exhibits, offices for interpretation and law enforcement staff, has a cozy AV auditorium, the bookstore/giftshop, will be a site for educational programs, and, of course, bathrooms. Here you will catch the shuttle to go to the Quarry Exhibit Hall. The QVC will serve as the place to find out what to do and where to go in the Monument after, of course, seeing the great Wall of Bones. 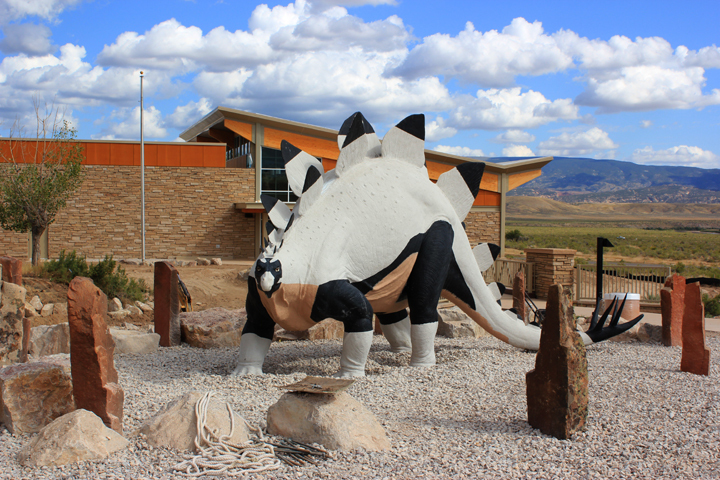 The new exhibits highlight the diverse historical, archeological, geological, paleontological, and biological resources of Dinosaur and directs you to where best to see them. 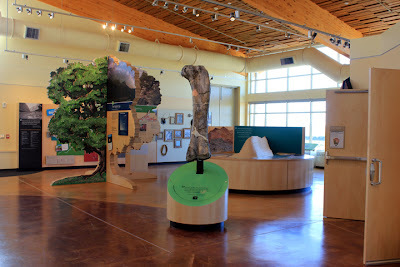 All this was sorely missing in the former Quarry Visitor Center and is a great addition to the park. 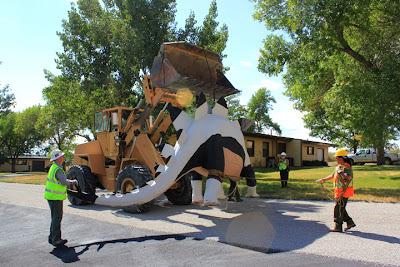 See my recent post about the move of the life-size Stegosaurus model to the front of this building. The Keynote Speaker was Ken Salazar, the Secretary of the Interior. After the dedication and opening I was able to tour Secretary Salazar through the nearly completed Quarry Exhibit Hall to see both the freshly cleaned bones and the new, dramatic exhibits. Secretary of the Interior Ken Salazar and posterior dorsals, sarcrals, pelvis, femur, and anterior caudals of Allosaurus fragilis. 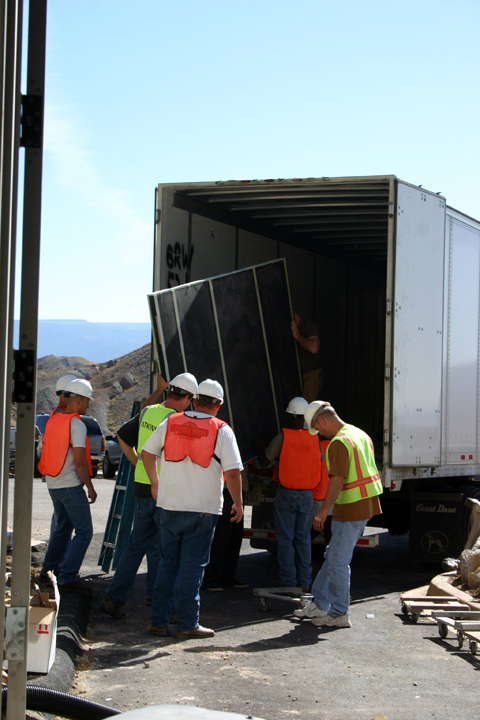 It wasn’t a long tour --- a Cabinet level position runs on a VERY tight schedule. One barely has the time to explain the differences in innervation of the laterosphenoid in camarasaurid and diplodocoid neosauropods. Fortunately a longer tour was possible for Regional Director John Wessels, although he did run out of time before I ran out of answers. The Grand Opening of the Quarry Exhibit Hall will be on Tuesday October 4. More news about that to follow. When we evacuated the exhibits from the Quarry Visitor Center many specimens went into storage rooms in the Monument. 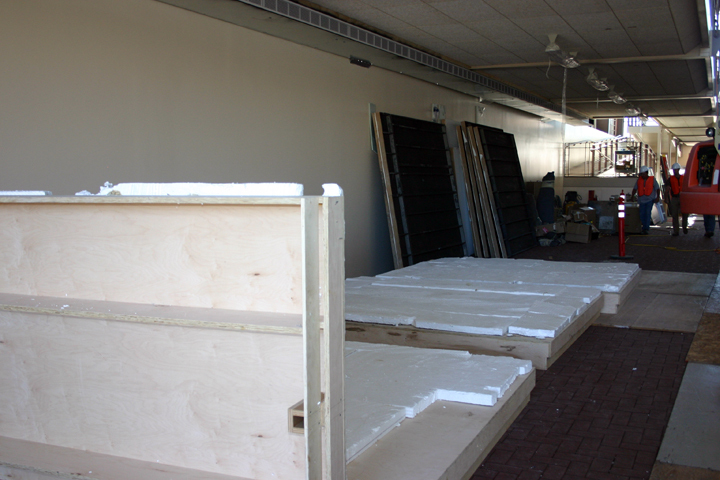 However, a few mounts were too large for any of our areas. They went to the Utah Field House of Natural History, in nearby Vernal, where they remained on exhibit. Last week these spectacular casts were returned and we are now setting them in place and building the new exhibits around them. The big skeletal casts (both slab and free standing) are of the famous Camarasaurus lentus puppy (only ¼ adult size), Allosaurus jimmadseni, and Allosaurus fragilis. 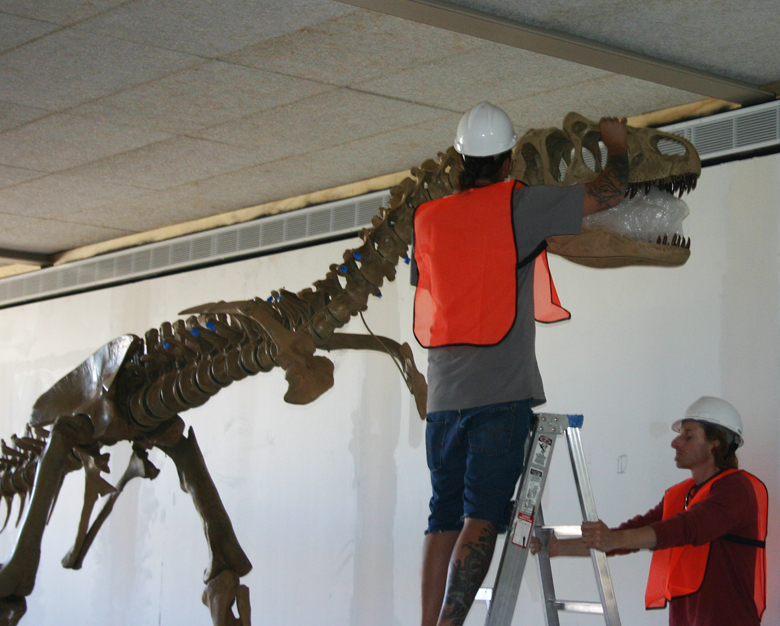 The Allosaurus fragilis mount was disassembled for transport and had to be reassembled by DinoLab on site. Many thanks to the staff of the Utah Field House and DinoLab (Salt Lake City) for moving these large, heavy, and delicate skeletons back to Dinosaur. Like aurigae in the Circus Maximus we are racing circuits to complete what needs to be done by the formal opening of the building on Oct. 4. There’s not much time left and there are many projects and crews now working side by side. On Monday September 19th the long awaited cleaning of the quarry face finally began. 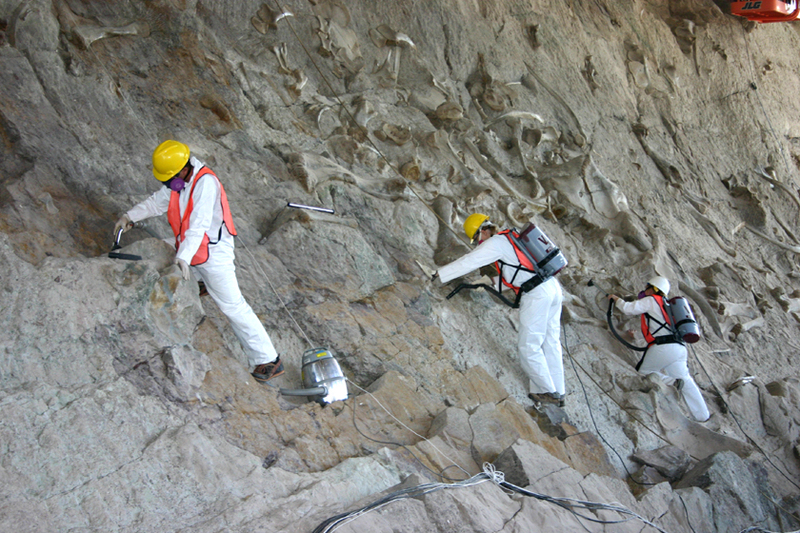 Years ago the cleaning of the quarry face was an annual event for the staff. 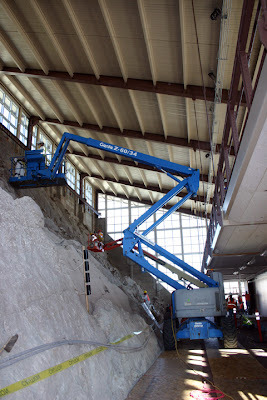 That changed when in the late 1990s the large indoor crane was damaged and could not be repaired. The crane was needed to hold the canister vacuums and get the staff to the high areas of the face. 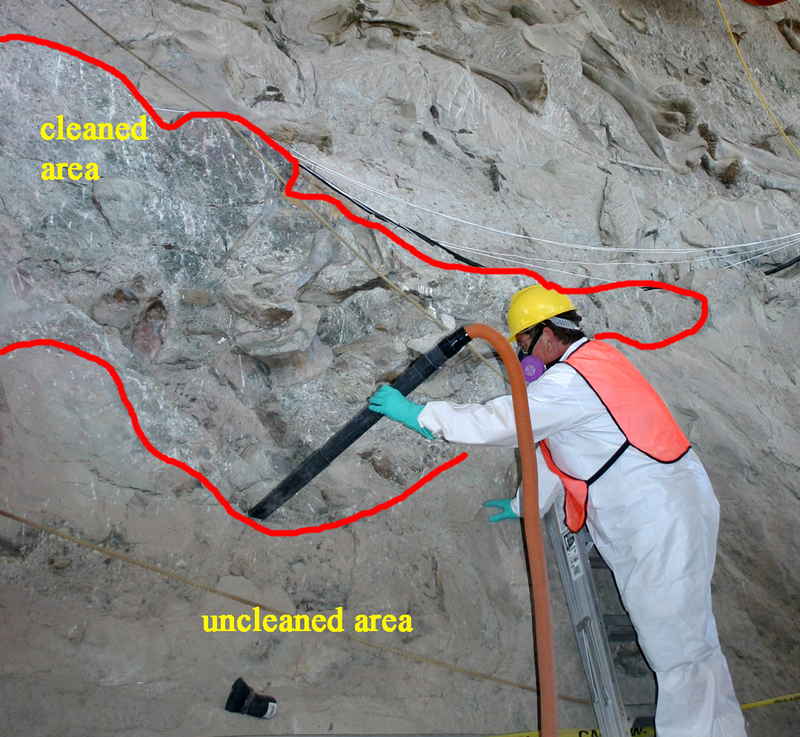 It took two people about a week to vacuum the entire quarry surface, both bone and rock. Without the crane there could be no cleaning. Of course, no cleaning was done once the building was condemned and closed in the summer of 2006. 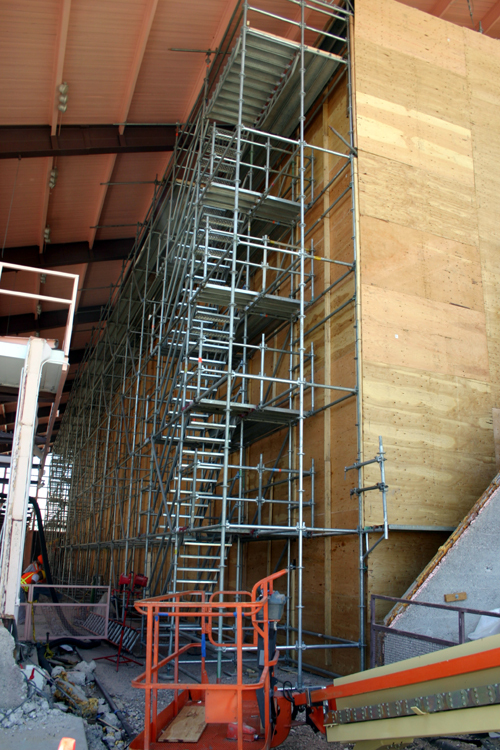 For most of the last 18 months the quarry has been enclosed within a immense plywood and scaffold sarcophagus (see several earlier posts about that structure). 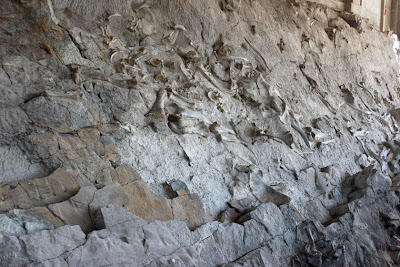 This protected the fossils from damage from tools and equipment but could not be made airtight. As a result, some dust from the demolition and construction work over the last year and a half got into the box and settled on the face. 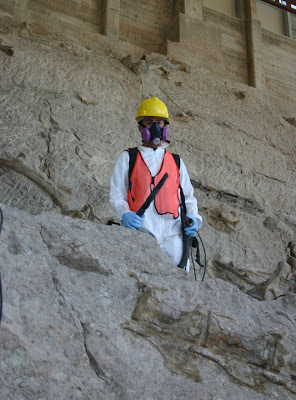 In addition, some rodents and bats found the sarcophagus a comfy place to hang out and defecate in. 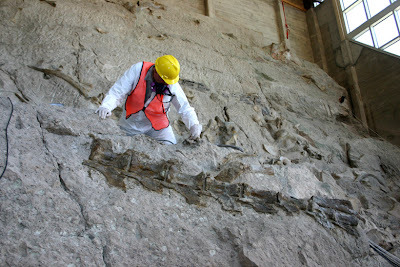 A short while ago the sarcophagus came down and the fossils and rock were exposed again within the building. However, quarry lacked its former splendor because of all the dust, dirt, and small bits of construction material on it. Bones could be seen but they did not stand out and the entire surface was a dull gray color. But cleaning up was more than just grabbing a broom. The dust posed several potential threats. 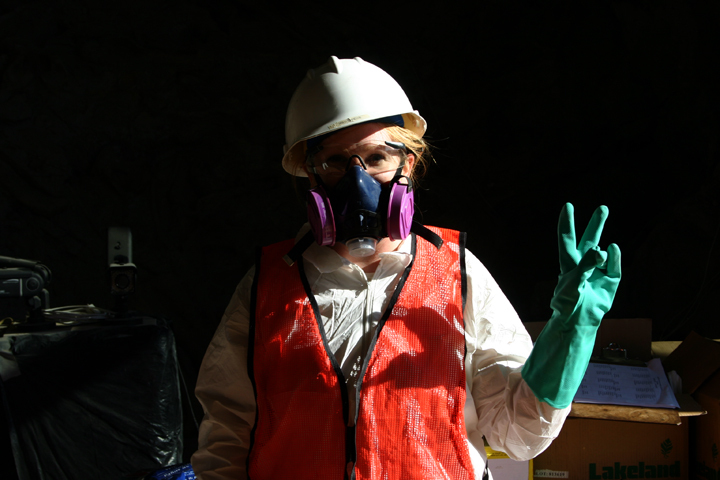 There was the possibility of infectious agents from the bat and rodent feces. Of greater concern was the level of radon in the dust. 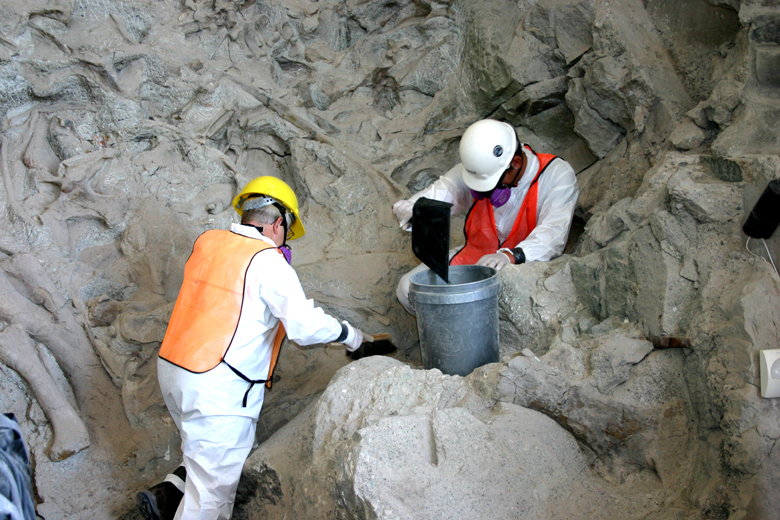 The quarry and its bone naturally emit radon which is a radioactive, colorless, gas byproduct of the decay of uranium. The radon particles become attached to dust particles, which if breathed in, can become lodged deep in the lungs and cause cancer years later. Fortunately, scientific testing of the dust revealed that there was little infectious threat and the radon levels were quite low. Nevertheless, personal protective equipment was required for the cleanup. 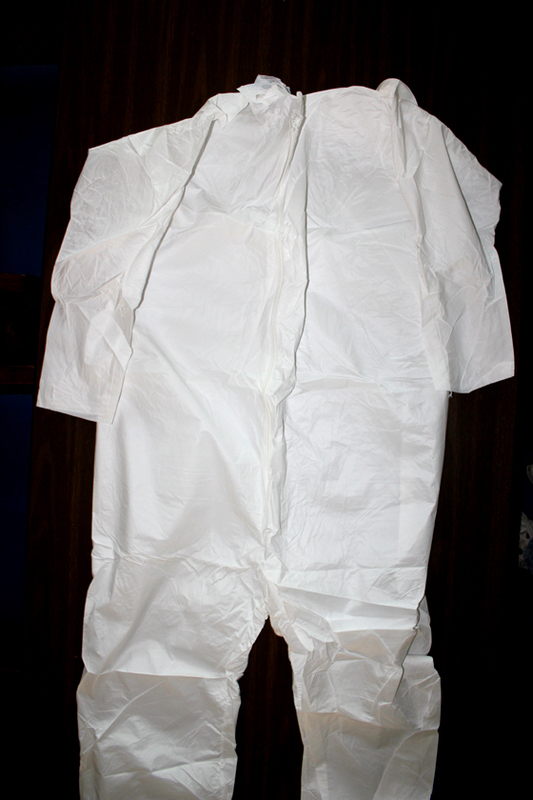 Disposable tyvek suits kept dust off the clothes. Similarly, gloves protected the hands and safety glasses did the same for the eyes. 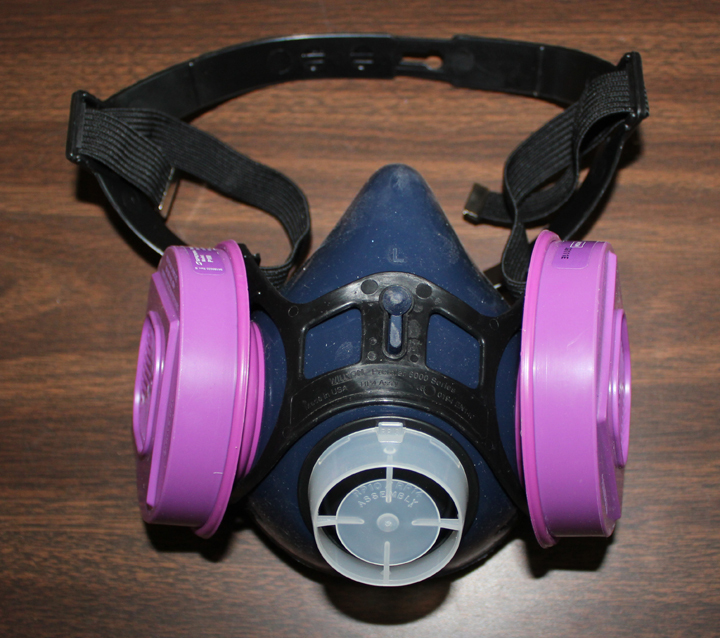 An appropriately sized and fitted respirator with filter canisters prevented breathing in any dust. A hardhat was required against the inevitable noggin knocks. However, once fitted out in this equipment, an employee looked eerily like a lab researcher from a biohazard facility. "Did anyone see where I put that vial of Ebola Reston." 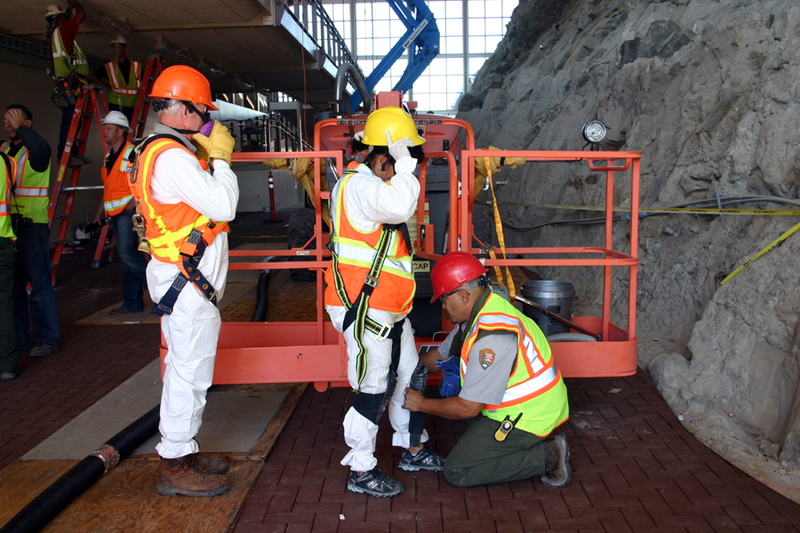 Those working from the lifts were harnessed up and leashed to the basket. Even the vacuum cleaners were somewhat special. They needed HEPA filters to prevent the finest dust particles from being blown around the building. The quarry face is about 50 feet tall and the upper third is nearly vertical to overhanging, so we needed to use lifts to get us up to and hold us in place while cleaning the highest levels. 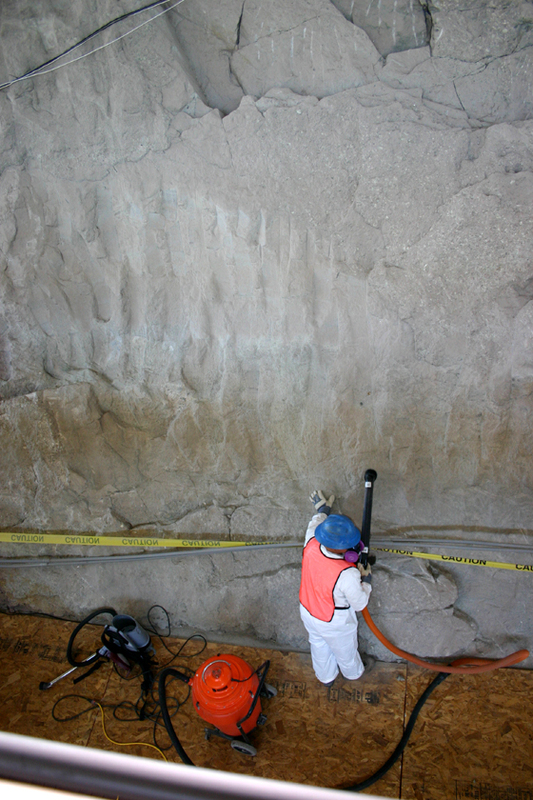 The lower third of the cliff could be vacuumed from ground level. In some places near the bottom the dirt and gravel on ledges was so thick it could be swept up and dumped into buckets. The middle third of the cliff could be walked across with a backpack HEPA vacuum, as long as one was carefull in placing your feet. The bones however, retained a thin layer of more intractable dust that the vacuums didn’t completely remove. 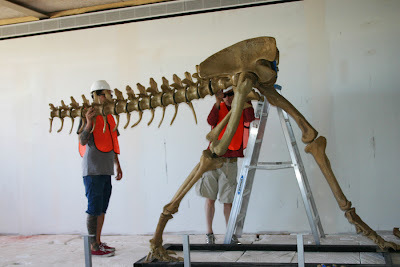 This could only be removed by hand wiping each of the 1500+ bones with a damp cloth. 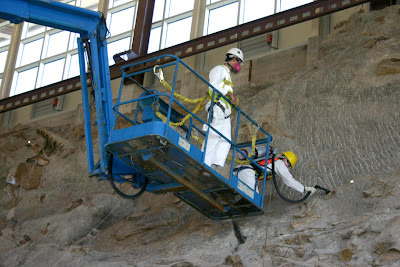 Surprisingly it took just five days to clean the entire 150 foot long, 50 foot high surface. That was less time than anticipated, which was a nice surprise, given the tight deadlines we were working under. The results are spectacular and the cliff face now looks better than it has in probably 15 or more years. However, photos cannot do it justice --- so come and see it for yourself. My heart felt thanks to all those who were involved in this effort, it could not have been done without them: April Wood, Noel Mays, Pat McElroy, Carla Lopez, Barbara Tallman, Clark Tallman, Jesse Hutchinson, Matt Mateo, Andy Mesko, Joel Brumm, Jake White, Zach Parkes, Marian Yazzie, Stuess Leeds, Zach Elkins, Angell Britt, Merlin Mott, Gary Mott, Wayne Prokopetz, and Dinosaur’s Superintendent Mary Risser. Things at the DinoMon have gone crazy. It's busy with people all over the place like some crank laced anthill. 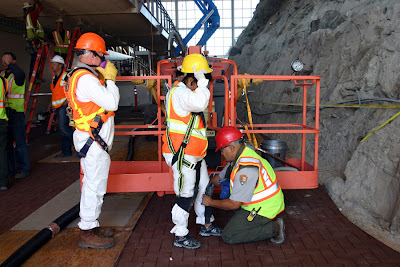 There are all these Men-In-White, wrapped up in biohazard suits and warning vests with helmets and face masks and filters like they were some kind of hemmorhagic fever chasing viral cowboys from the Level 4 Biohazard Containment facilities at the CDC. And like whatsup with this lady? Man I swear I saw her in that movie Contagion.She was vaccinating sick people. 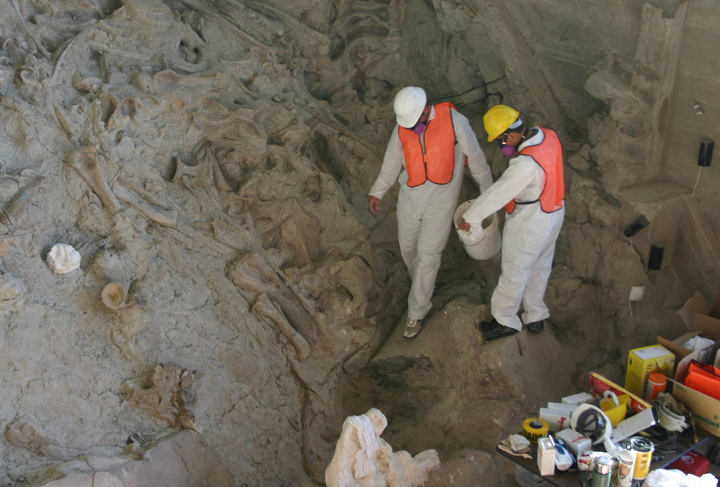 Or maybe she was piling bodies up in the mass graves. I can’t remember exactly but she totally wigged me out. Can anyone tell me what insane weapon is this guy carrying? Is that a flame thrower for decontamination? Or for killing zombies? I sure didn't like the way he kept staring at me. Then, out of nowhere more people with helmets came and began bringing boxes and all kinds of strange stuff in and laying it on the floor. Later a couple of guys rolled into the place with this thing. An hour later they suddenly vanished without a trace ... but left this behind! Some of the mysterious, Men-In-White, government agents used this blue Imperial Walker to do who knows what work up on the dino bones. It looked to me like they were sucking DNA out of the bones for some kind of freakin’ genetic cross breeding experiments, like the aliens do between humans and turtles and aardvarks. I know because I read all about that on a TV show. 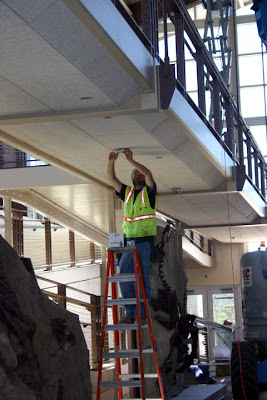 Other guys were putting wires and other objects in the ceilings and walls, like maybe x-ray cameras disguised as smoke detectors. Very black box kind of stuff. Anyway, like I said, these are whack crazy days at the QVC, but it is really Really, TOTALLY AWESOME dudes! 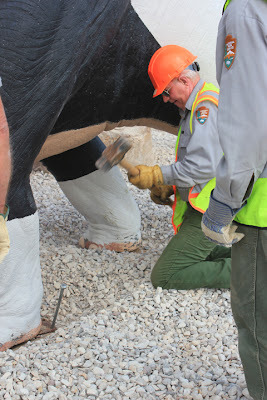 Photos: All these top secret photos are from agents within the NPS. 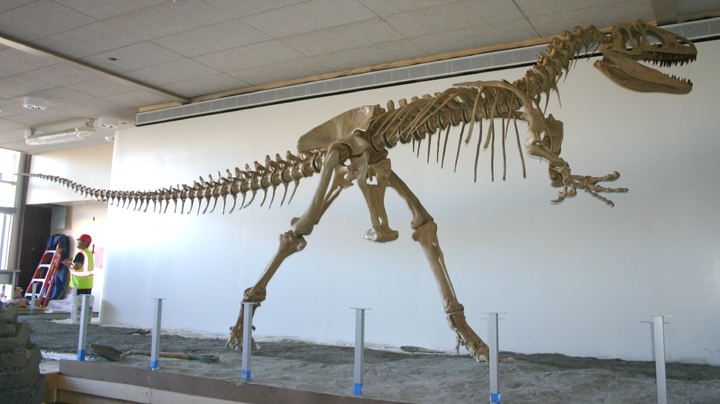 Dinosaurs were the dominant large terrestrial vertebrates for about 160 million years. During that time they occupied all landmasses, a wide variety of environments, and became quite diverse both ecologically and biologically. Those living, in what was then the polar regions, faced severe seasonal changes and evolved a number of strategies to cope with those changes. As recent histological work by Woodward and colleagues shows, some polar dinosaurs hibernated and others stayed in the area but remained active, suggesting an elevated body temperature (“warm-blooded” if you wish). Of course, another strategy was to undergo grand migrations, heading towards the more temperate areas in the winter and back to the polar regions in the summer. Here at Dinosaur National Monument we have our own dinosaur migration and although it only involves one specimen of a single species, it is of immense significance. 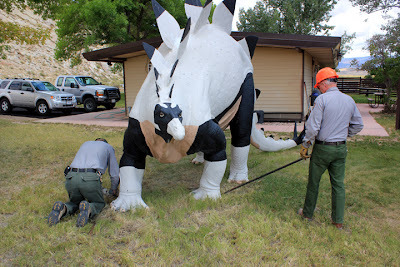 A mere 18 months or so ago, our life-sized Stegosaurus model underwent an arduous migration of nearly ¾ of a mile from the closing temporary visitor center to the west border of the Green River Resource Center. Now, as the end of the building rehab projects at Dinosaur approaches, it’s time for this beast to once again prepare to greet visitors. 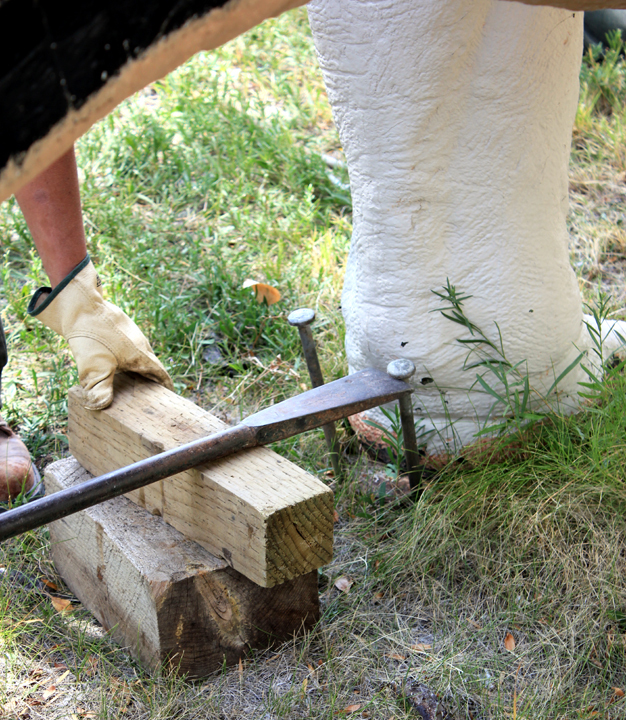 To prepare it for its move, we first remove the long anchoring spikes in each of the footplates. Next an eyebolt is threaded between the dorsal plates and into the internal armature. 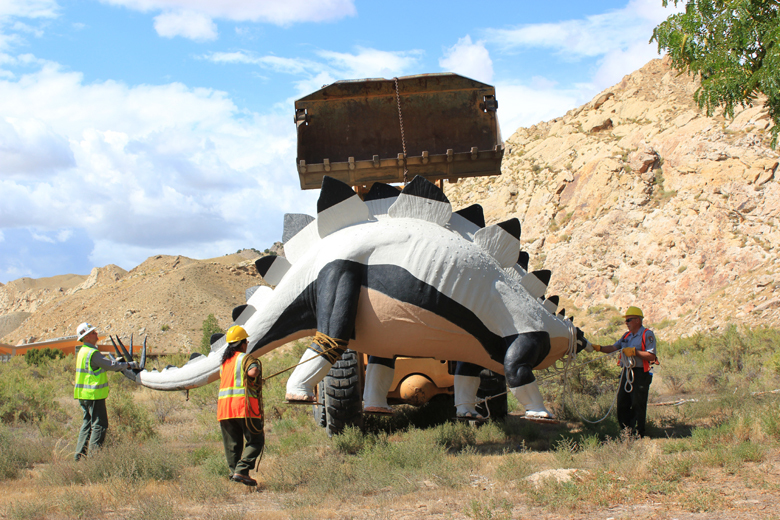 A chain is attached to the eyebolt and a front end loader and the Stegosaurus is gingerly lifted up. 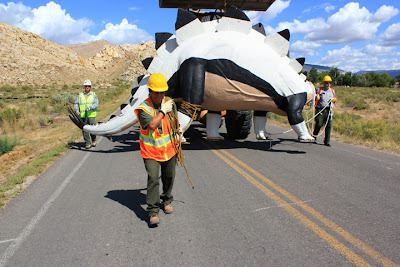 Ropes are slung around the legs to stabilize it during transport. Fortunately we don’t have to move it cross country but can take a paved road to the new Visitor Center at the bottom of the hill (not the visitor center enclosing the Carnegie Quarry). Once there, it is placed in its new display area in front of the building and, given the known proclivities for wanderlust in Stegosaurus, the feet are pinned to the ground. 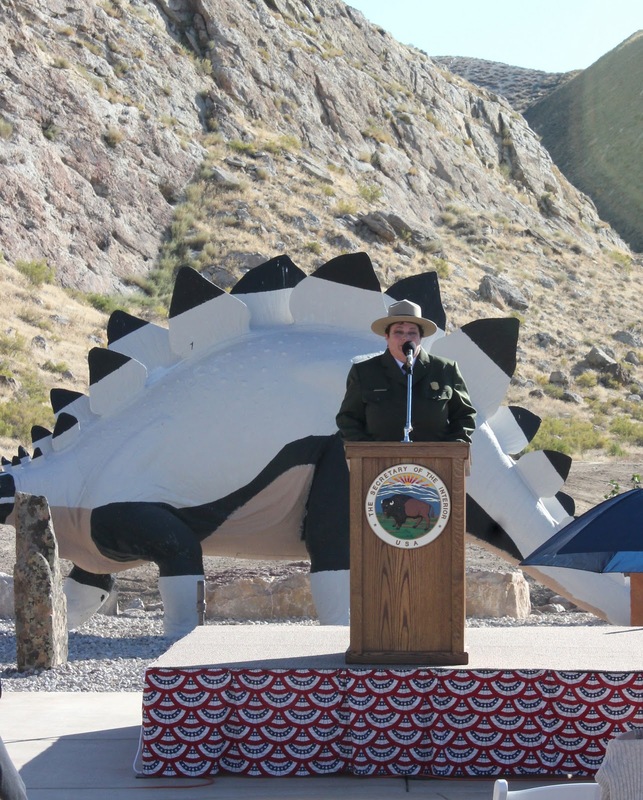 All visitors who come to the Monument will pass by this ancient reptilian plant-eater with a walnut-sized brain. However, as constant readers are well aware, our Stegosaurus made a more spectacular migration nearly 50 years ago. 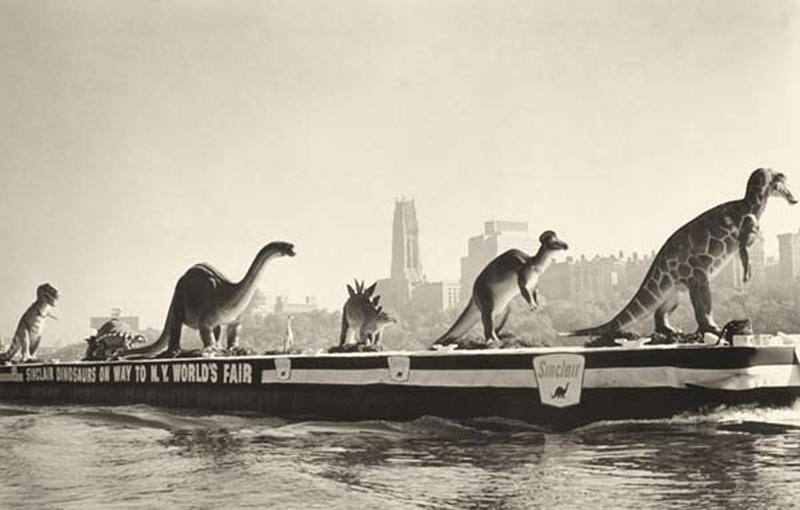 In 1963, our model (along with models of Tyrannosaurus, Apatosaurus, Ankylosaurus, Coelophysis, Corythosaurus, and Hadrosaurus) rode a barge across New York Harbor on their way to a 2 year stint at the Sinclair Oil Company Exhibit at the 1964 World’s Fair in Flushing Meadows, New York. That’s our model third from the right. After the World’s Fair ended, the Sinclair dinosaurs toured the US. 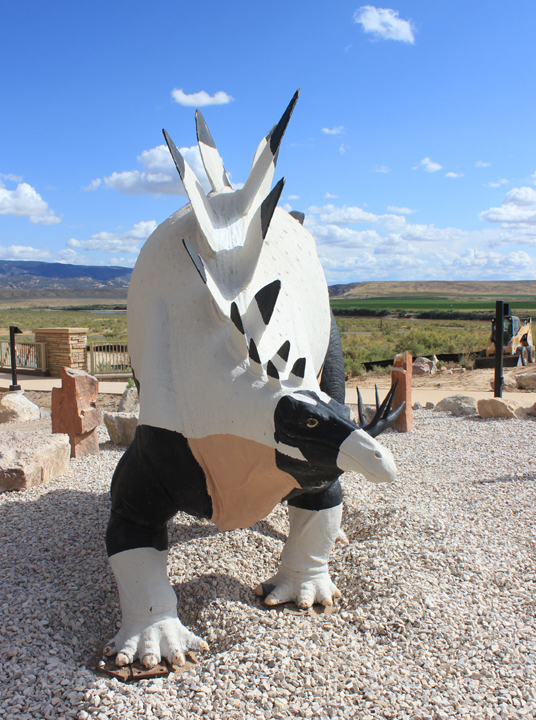 Here’s our Stegosaurus at the East Hills Shopping Center in St. Joseph, Missouri. Eventually the Stegosaurus-that-could arrived at Dinosaur National Monument where for the next half-century it met visitors coming to look at its remains and those of its contemporaries. 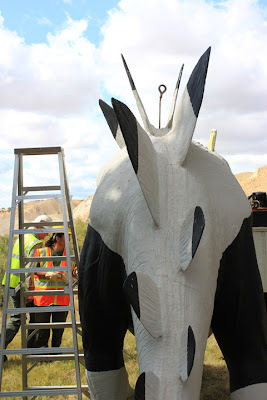 Now that it is back in place, things can start to go back to normal. So in recognition of this great moment, raise a glass to the next half-century, Salut!